1. Robo Recall – sci-fi action where you take on an army of robots; one of the best VR games I’ve played. (Note: there are many other free apps and games for Oculus Rift). At this price, it’s actually now the most affordable desktop VR system, and actually costs less than a Playstation VR (which costs $399 but needs a PS4 camera and controllers) and is just half of the cost of an HTC Vive ($799). At this price, I’m almost tempted to get another one to play with my kids…. hmmm. Besides their capabilities, what I like best about the Oculus Rift is the software. The Rift has the VR games that I like best among all the systems such as Robo Recall, the Unspoken, Superhot VR, Dead and Buried, and other very polished games. You can buy a PC with an Intel i5-4590 and 8GB of RAM for around $250 – see here if you don’t believe me 🙂 (make sure it has an available PCI slot) and the GTX 1050 Ti 4GB for $150, for a total of just $400, the same price as a Ps4 Pro. And yes it really can play games without problems (see these demos). Besides playing VR, a VR-capable PC will also be much faster at stitching and rendering 360 videos. 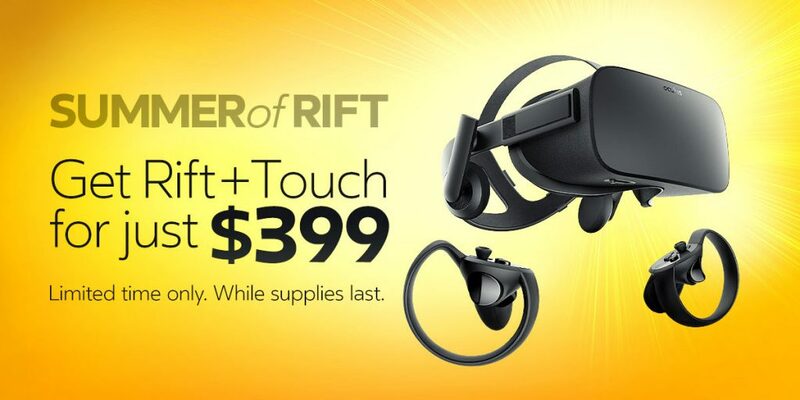 If you’ve ever thought about getting a desktop VR system, I think this is the best deal you will find anywhere.